It is a fairly well-known statistic that the average age at which a scientist wins the Nobel Prize is 59. But a new analysis has investigated the age at which Nobel laureates actually do the research that won them the prize. 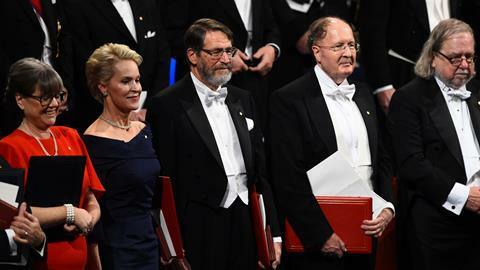 Rasmus Bjørk, a researcher at the Technical University of Denmark, used biographical information on past winners from the ‘advanced information’ documents published by the Nobel Foundation, which cite the papers that are considered most relevant to the prize for each laureate. The data includes 46 chemistry laureates who have won the prize since 2000, as well as 61 physics laureates since 1995 and 30 physiology or medicine laureates since 2006. He looked how old the laureates were at the time their most relevant, career-defining papers were published in order to come up with an age range at which they were doing their most ‘ground breaking’ work. He found the average age at which chemists did the work that won them the Nobel prize was 46.5, compared to 42 for physicists and 45.1 for physiologists. Bjørk also looked at the ages of laureates in the year they were awarded the prize and calculated an average ‘waiting time’ between scientists doing their best work and getting a Nobel for it. For all science laureates, the average waiting time was around the 20-year mark – 20.8 years for chemistry, 21.2 years for medicine and 23.5 years for physics. The figures support the observation that the age at which Nobel prize-winning scientists perform their most important work has increased. An analysis that looked at winners from 1901 to 1950 found the average age at which scientists were doing their Nobel prize work was just 35.4, and for chemists it was 38.3.